Catalonia votes today on independence from Spain, that is to say, many Catalans will try to do so, although it appears there will be many roadblocks to voting created by the federal government, which has declared the vote illegal. It’s not clear what the outcome of the vote will be, but it’s likely it will not settle the question of Catalonian independence, just as the vote in Scotland in 2014 has not prevented a movement for a new vote for independence. Young Catalans largely support secession. 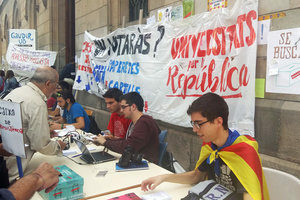 In fact, at the University of Barcelona students have occupied buildings in support of non-interference from Madrid. One student commented on NPR: “I think in Catalan and I dream in Catalan,” says Marta Rosique, 21. ” I think in Catalan and I dream in Catalan…And then there is a government that tries to do as much as possible so that Catalan doesn’t exist anymore! There is something that tells me to fight for my own identity, for my own language.” For that student, at least, identity and language are interchangeable. An interesting aspect of the movement has been the non-verbal demonstration of support for independence through the nightly 10 p.m. banging of pots and pans on Barcelonan terraces and balconies. This began last month, after the Spanish government started sending in army troops to prevent the referendum. This is a form of social protest familiar in South America (known as cacerolazo, cacerolazo, or casserole). The pot banging may be low-tech, but it’s loud and coming at a time when Barcelonans are starting their evening eating and socializing, which gets going later in all of Spain than in other European countries. This entry was posted in Conflict, Cultural identity, Language, Non-verbal and tagged Spain. Bookmark the permalink.